"I chose to study at Nottingham Trent University (NTU) as I was impressed by the social sciences department, the enthusiasm of the lecturers, and the sporting opportunities and facilities available. NTU stood out from other universities as I liked the teaching style and the option to choose some of my modules so I could tailor the course to my personal interests. "The Gender, Violence and Society module has been my favourite; it deals with issues that I'm very passionate about, and I've enjoyed the chance to explore these and write a blog post about them. "The student support and facilities have been great - there is always somebody around willing to help, and I have made use of the 24-hour library and the climbing wall. The NOW system is a really convenient space to access all the necessary course information like assessment specifications and lecture slides. 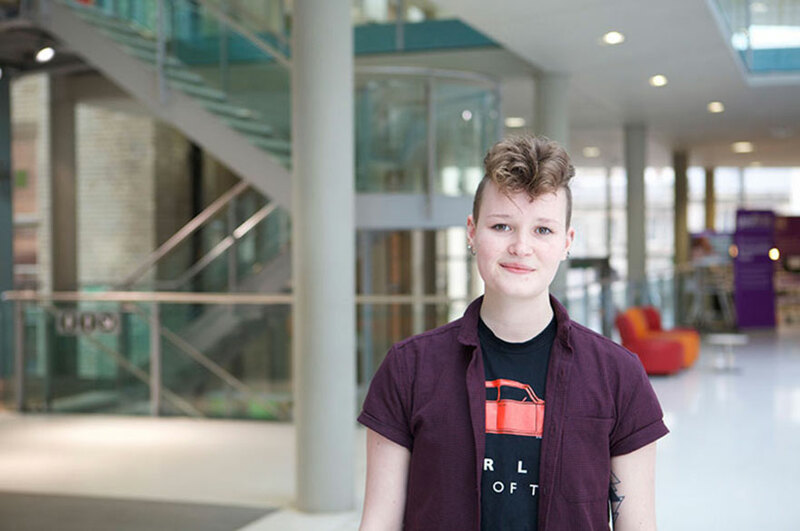 "As well as developing my academic skills, like a lot of people at university I've really figured out who I am and have felt comfortable in expressing that at NTU. There was so much to do in Welcome Week, and the fresher reps were always on hand getting everyone involved. I've taken up climbing (with the climbing wall so conveniently in the Students' Union) - it's so much fun! I'm the treasurer of NTU Pride Society, which is a community in which everyone is accepting of each other, and I've met some awesome people and made great friends. I'm also an active member of the Vegetarian Society which runs really fun events, creating a great little community. "This is my first time living away from home. Being from Nottingham I could have stayed at home, but I'm so glad I moved into student accommodation. You really learn a lot, get a lot more involved in the experience of university life, and you get your own autonomy. I'm from Nottingham originally, but being at university has given me a new perspective on the city. It has everything you could want, there's always something going on, and there are so many little places I've discovered that I never realised were here."